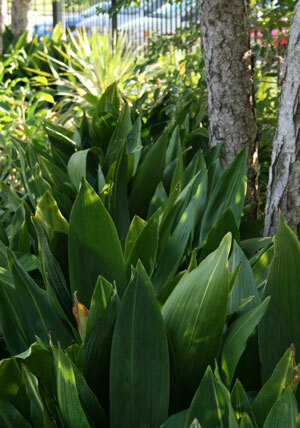 Aspidistra elatior originates from the woodlands of the Himalayas, China, and Japan. Cast Iron Plant has long lasting lance-shaped leaves that are pointed at the tip and narrow at the base. This rhizomatous perennial bears inconspicuous cream colored flowers near the ground in early summer that are normally covered by the foliage. This groundcover can tolerate full sun but will look ratty so it is best with some shade. Aspidistra elatior is valued for it’s ability to tolerate full shade, fluctuating climates and neglect, at maturity reaching 1.5-2′ tall. Also known as Barroom plant because of it’s use in bars, very tolerant of neglect!